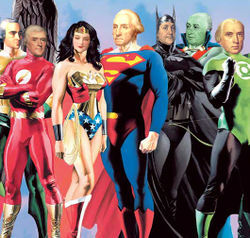 The supposed American Justice Coalition: John Hancock, Thomas Jefferson, Betsy Ross, George Washington, Benjamin Franklin, John Adams, and James Madison. For those without comedic tastes, the so-called experts at Wikipedia think they have an article very remotely related to Founding Fathers. For over two hundred years the Founding Fathers of America have been a source of wisdom and insight for Americans. 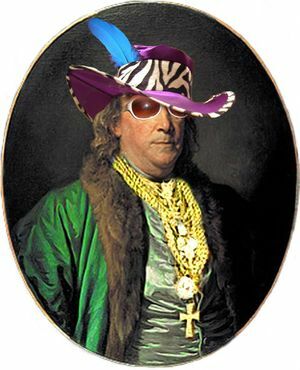 However, a national study carried out by a renowned historical expert called James Hancock has revealed that middle and high schools in America frequently exaggerate the intelligence, achievements and superpowers of the country’s founding fathers. Participants in the study were given a battery of questions and tests to determine their level of knowledge with respect to Washington, Thomas Jefferson and other founders of the country. Results reveal that, among other statistics, 18% of all participants from sixth to twelfth grade think that John Hancock wrote the Declaration of Independence; slightly over one-half assert that Washington was the first president to take up residence in the White House; and about one in ten students believe that the Revolutionary War was won when several founders joined forces to form the American Justice Coalition, complete with colorful costumes for each member. Ben Franklin not using his powers of invisibility. Note the rose-colored glasses. Perhaps the most disturbing results from the study came from the free-response section of the test, in which students were given a broad prompt word, such as “freedom,” and invited to expand on the subject with regard to their knowledge of the founding of America. Such a passage seems like it would belong in a fifth-grader’s history report. Alarmingly, this error-ridden excerpt, which also declared that Washington had an intelligence quotient of 300 and was forty feet tall, was actually written by a college-bound high school senior. Along with the participation of the students, dozens of teachers were asked to comment on the state of education regarding America’s founding. Many of the comments pointed to factors outside the schools that influenced students’ historical beliefs. “Children today are more influenced by television and comic books than by their classes,” one teacher from Baton Rouge, LA, stated. “They see Batman and Spider-Man and want their national heroes to be as exciting and powerful as their make-believe superheroes. Someone, perhaps a parent, needs to take some responsibility and eliminate the influences that bring about such ridiculous notions. Our founding fathers were remarkable in many ways, and if our students would simply realize this they would have a great appreciation for these men and their accomplishments without having to invent outlandish backgrounds for them. Last week one of my students tried to tell me that James Madison invented the atomic bomb in order to kill the Indians! This page was last edited on 23 October 2014, at 02:54.